Blouse: Banana Republic, 5+ years old! I got this off eBay, but it’s from Holiday 2004. Wow! And that’s where the title comes in. I am too hot to change my handbag. I had different shoes/blouse on earlier, but an unfortunate incident with a burrito required an outfit change before I go craft this evening. And it’s too hot for me to go back upstairs and deal with the fact that I should be carrying my grey Maryann bag. Heat, I don’t mind you, it’s your evil twin sister humidity that I dislike. She is quite the witch on a broom!!! 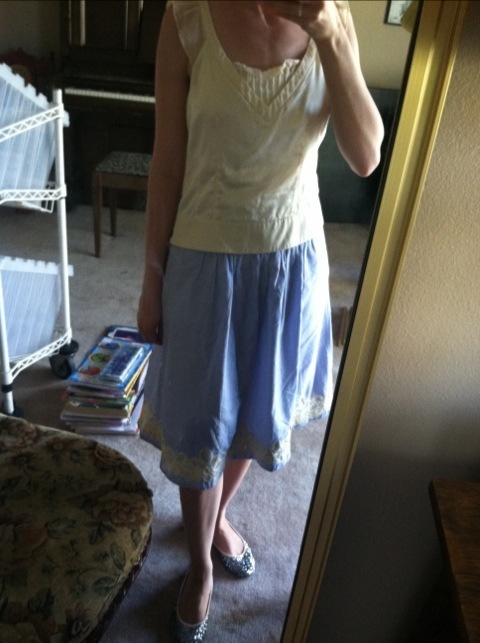 This entry was posted on July 23, 2012 by katespadegirl. It was filed under Outfit of the Day and was tagged with Banana Republic, jcrew, Kate Spade, Lauren Conrad.